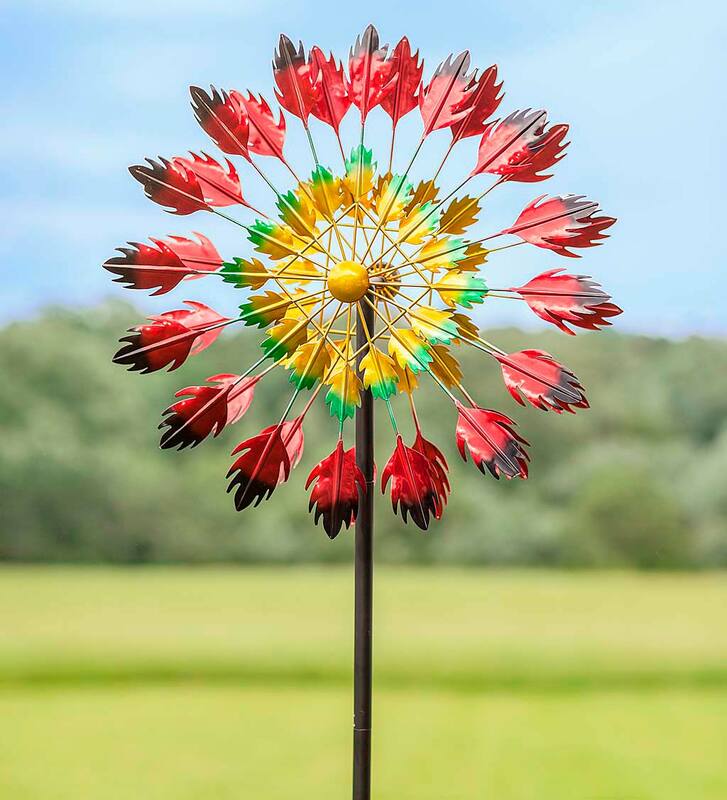 This Red Feather Wind Spinner is an eye-catching accent full of color and motion. Red feathers represent strength, energy and courage. 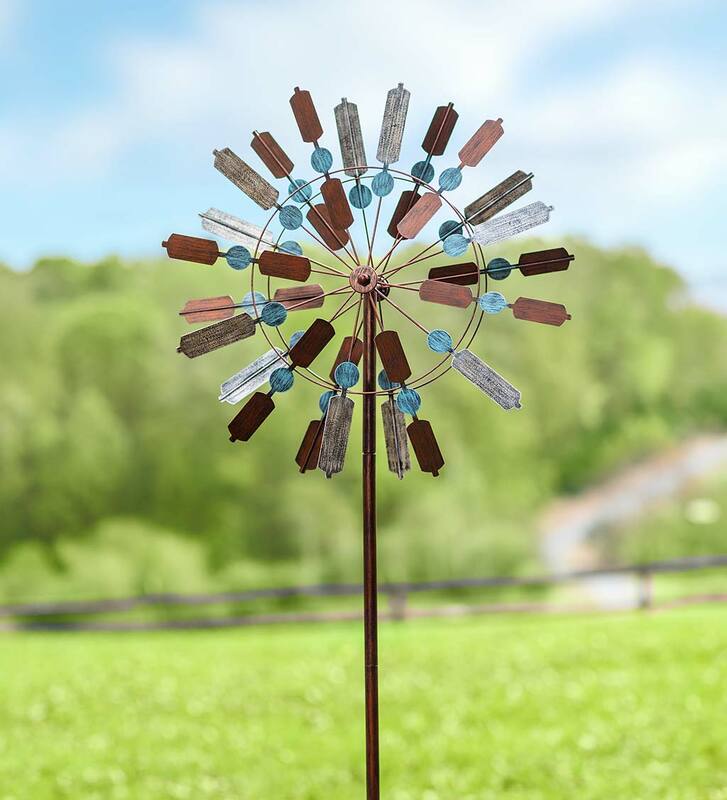 This spinner will surely bring vitality to your landscape, especially in the winter months when the landscape can lack color and warmth. The outer ring of larger feathers are red with black tips, while the inner ring is golden yellow with green tips - the colors contrast beautifully and the effect is stunning. Watch while the breeze sends the bidirectional rotors into a whirlwind of spin for an amazing display of art in motion. Truly a mesmerizing spectacle to enjoy! 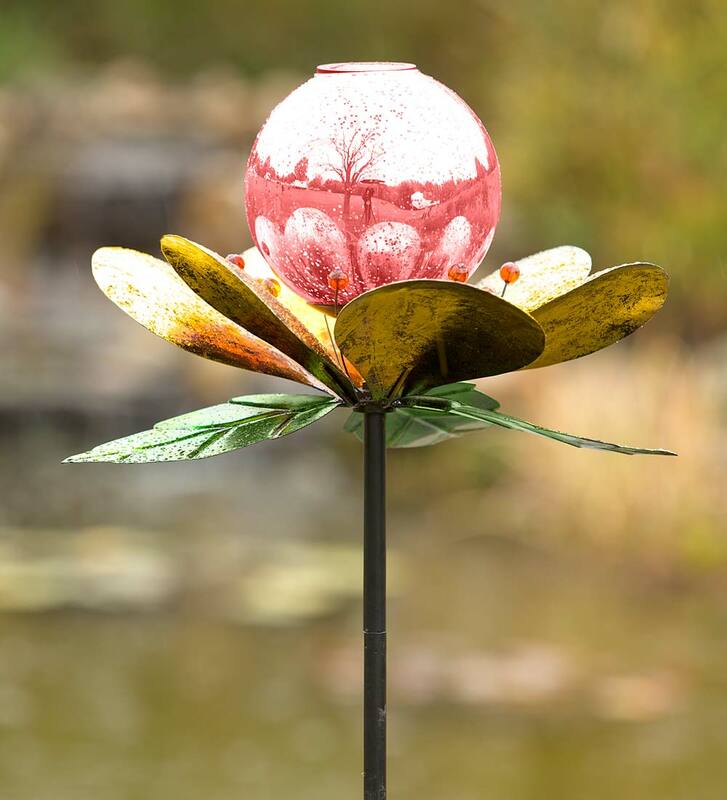 Mount this painted metal spinner anywhere in your landscape: garden, front or back yard, flower bed, along a pathway. The sturdy black metal post has a three-prong stake for secure installation. 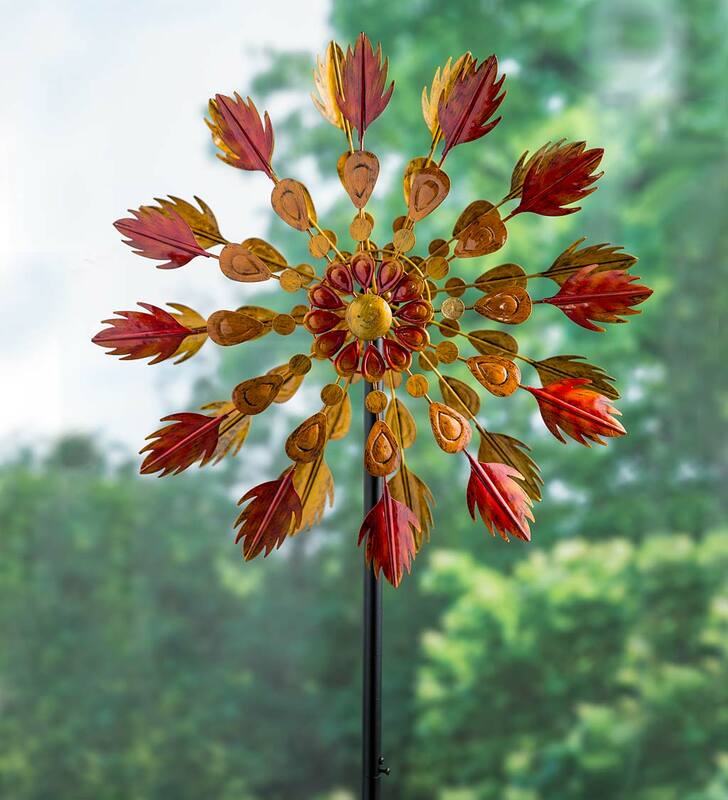 A delight to watch, our Dandelion Wind Spinner will mesmerize you with its color and motion. The unique design is inspired by the seed head "puffball" that children make wishes upon. Two folded petals per spoke catch the breeze from any direction. The outer layer is two-tone brushed copper, while the inner layer is antique blue - the colors contrast beautifully and the effect is stunning. 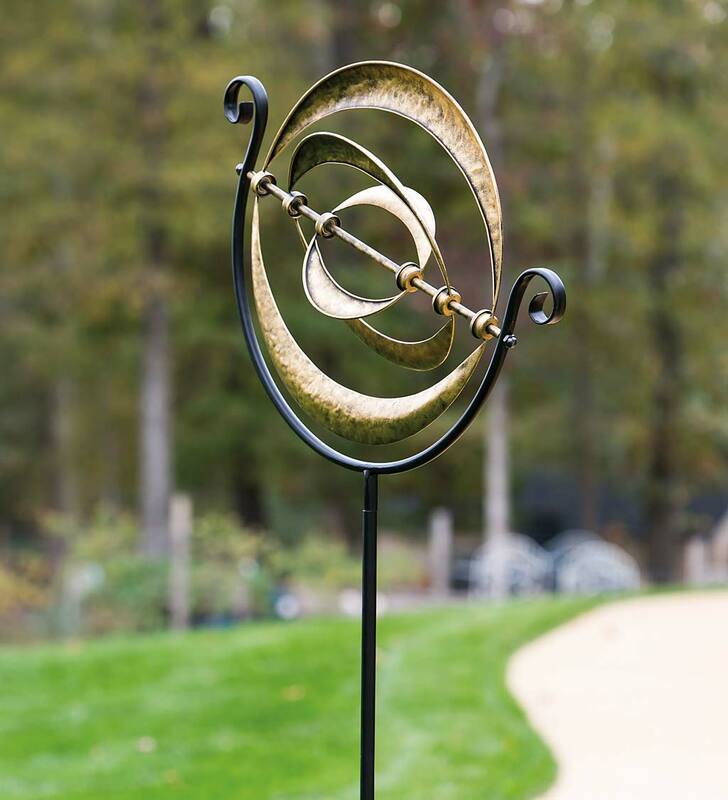 This spinner brings drama and dimension to your landscape even when there's no breeze. Plus, it adds color to your yard in all four seasons. Watch while the breeze sends the bidirectional rotors into a whirlwind of spin for an amazing display of art in motion. Truly a mesmerizing spectacle to enjoy! 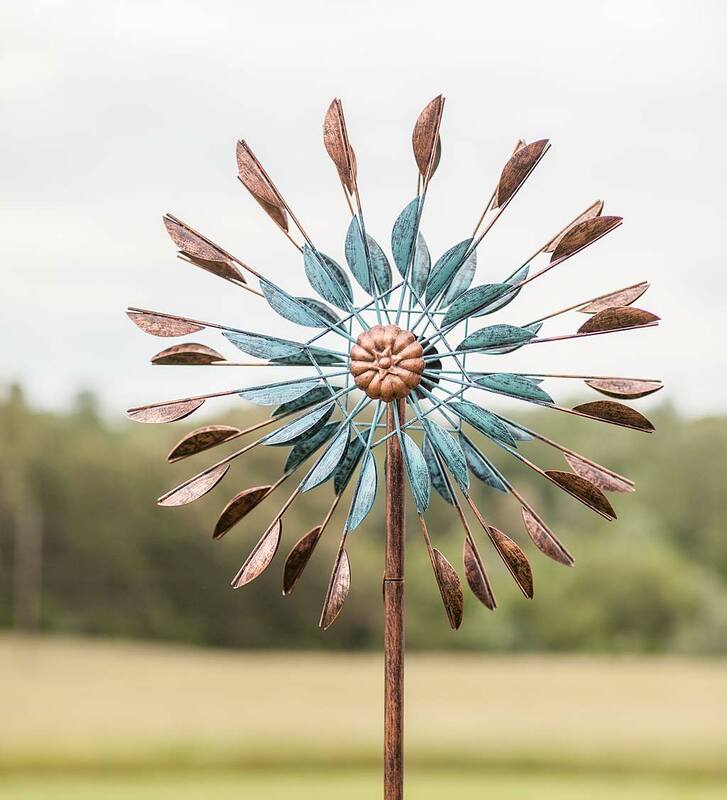 Mount this painted metal spinner anywhere in your landscape: garden, front or back yard, flower bed, along a pathway. The matching brushed copper post has a three-prong stake for secure installation. 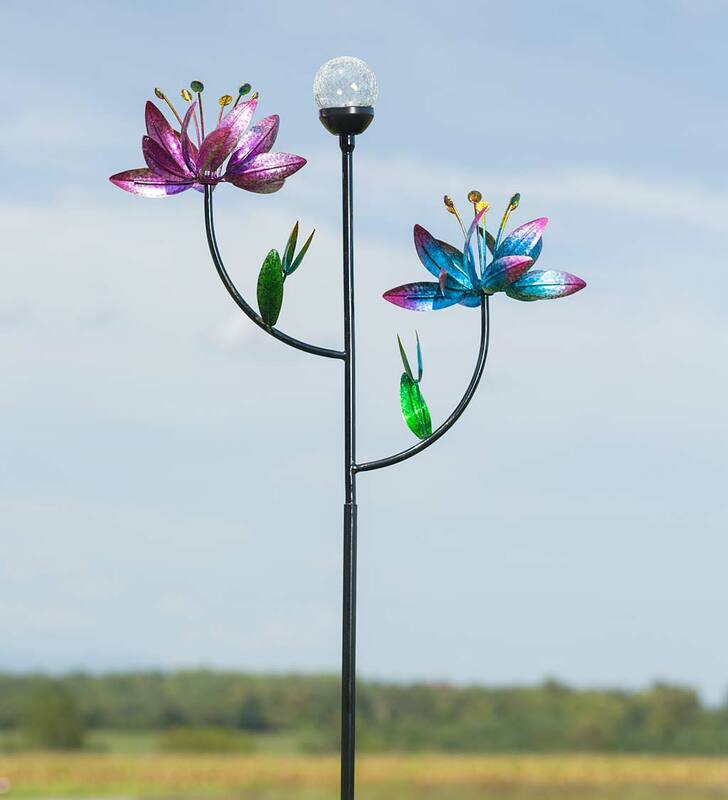 This simple yet elegant garden accent will make your yard look out of this world! 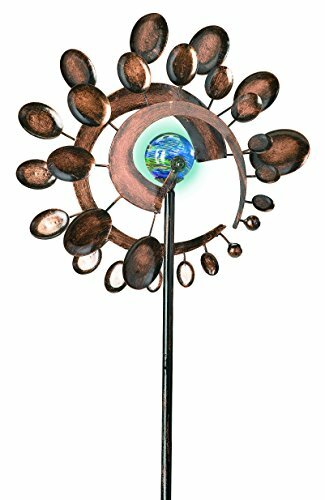 Our Galactic Metal Wind Spinner has a kinetic component that resembles planets orbiting on an axis. The hammered metal finish reflects sunlight and works well with all garden colors and the scrolled finials add an elegant touch. 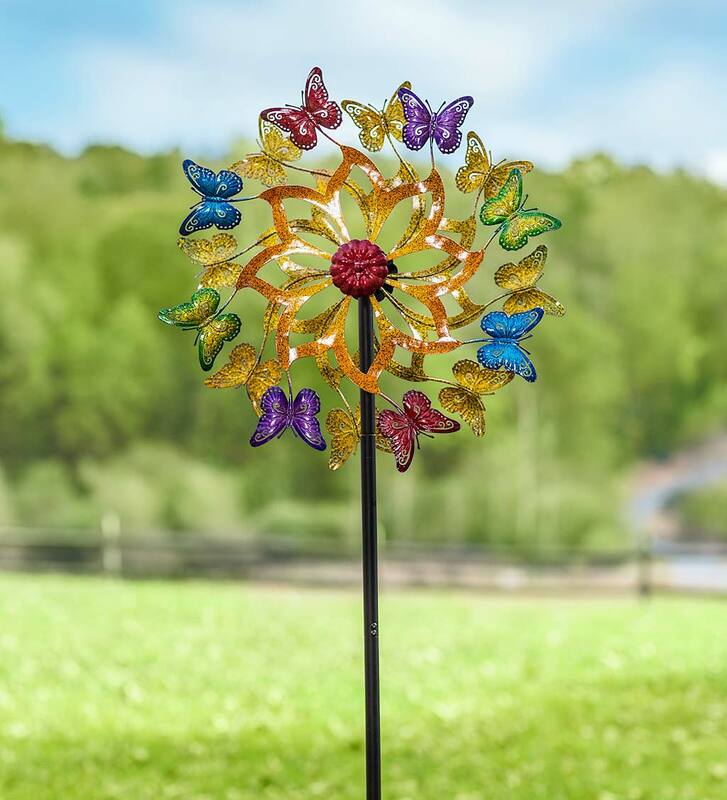 This Colorful Metal Butterfly Wind Spinner features brilliant butterflies spinning around a flower center. Dual-motion rotors move independently for a mesmerizing effect from any angle. With its bright colors and intricate laser-cut details, this kinetic yard art makes a bold statement. 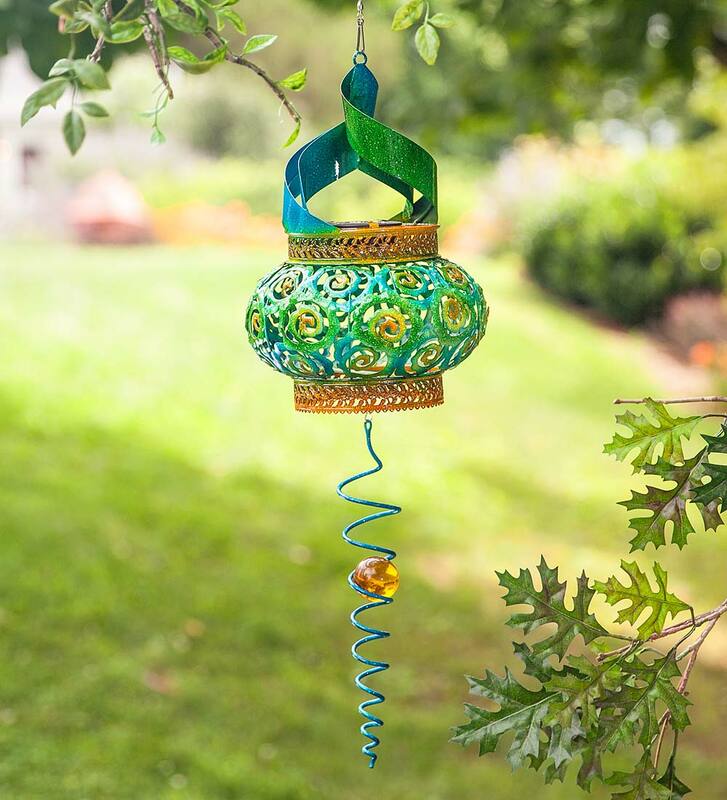 Place the spinner in your garden or make it the focal point of your yard. It looks great any time of year! Sturdy metal pole with ground stakes keep it in place. Easy assembly. 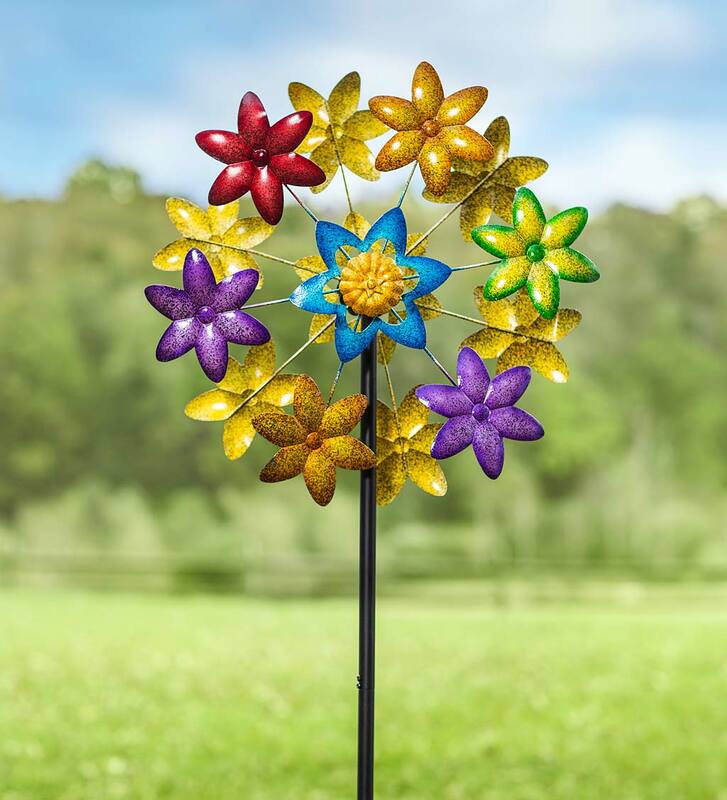 This Colorful Metal Flower Wind Spinner features brilliant, multi-colored flowers spinning around a center flower. Dual-motion rotors move independently for a mesmerizing effect from any angle. With its bright colors and intricate laser-cut details, this kinetic yard art makes a bold statement. 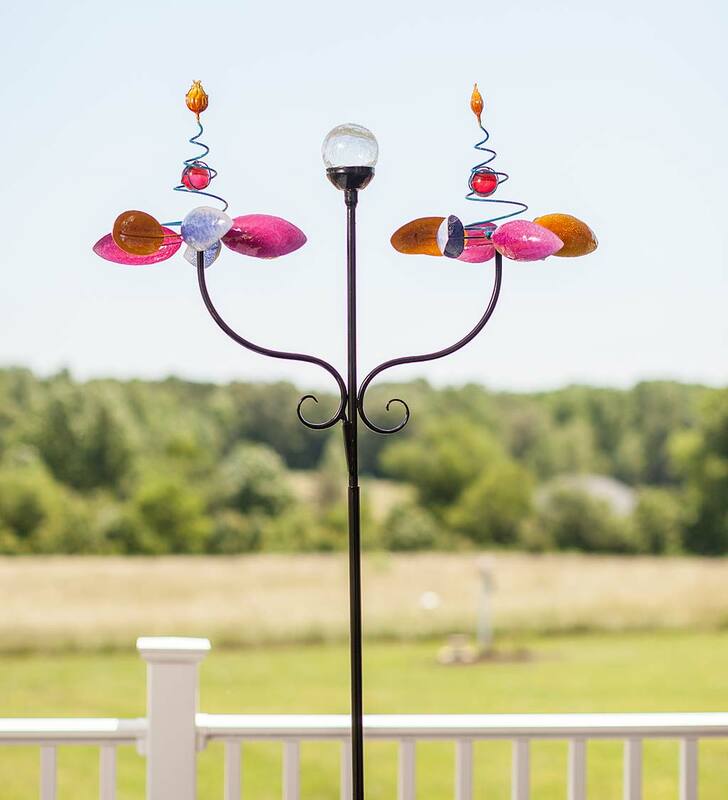 Place the spinner in your garden or make it the focal point of your yard. It looks great any time of year! Sturdy metal pole with ground stakes keep it in place. Easy assembly. 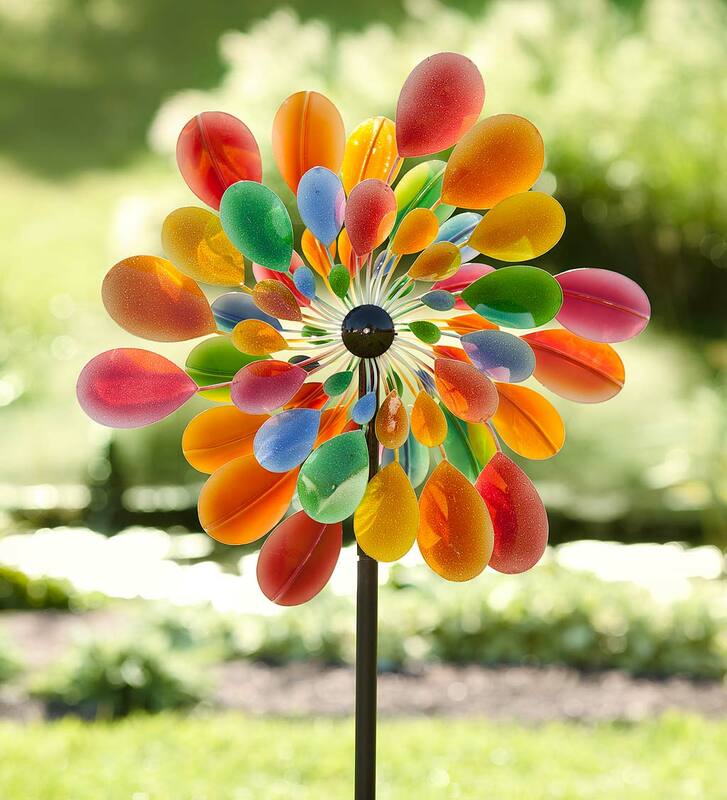 Our Double Flower Spring Spinner with Color-Changing Solar Ball brightens your yard with abstract style and motion. Spinning petals create a brilliant show rotating around the two spring-like, spiral spokes, each with a colorful glass ball. You'll be mesmerized by the hypnotic, kaleidoscopic effect. The light and airy design is a lovely addition to any yard. Plus, a crackle glass, color-changing solar ball lights up at dusk for a great show. This spinner is fun day and night! Metal with a colorful high-gloss finish. Sturdy metal pole with ground stakes. Easy assembly. 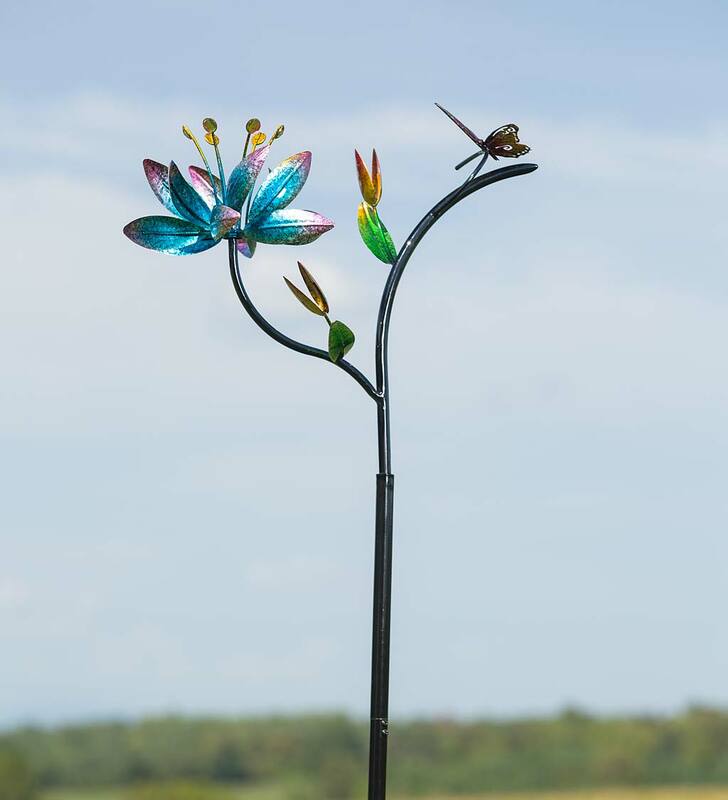 Blue Burst Studio M Kaleidoscope Spinner, 18"
Our Single Flower Wind Spinner with Butterfly adds new life to your landscape. Just plant this eye-catching, artistic accent in your flower bed, and you'll be all set for the season. No matter what time of year it is, you'll love the motion and color this spinner brings to your yard. Loaded with details, this unique accent features a moving flower that catches the breeze and spins beautifully. Sparkling gems and a colorful butterfly give it even more pizazz. Metal with a durable, all-weather finish.